Vintage Kenmore Deluxe Rotary ~ Would Love More Info! 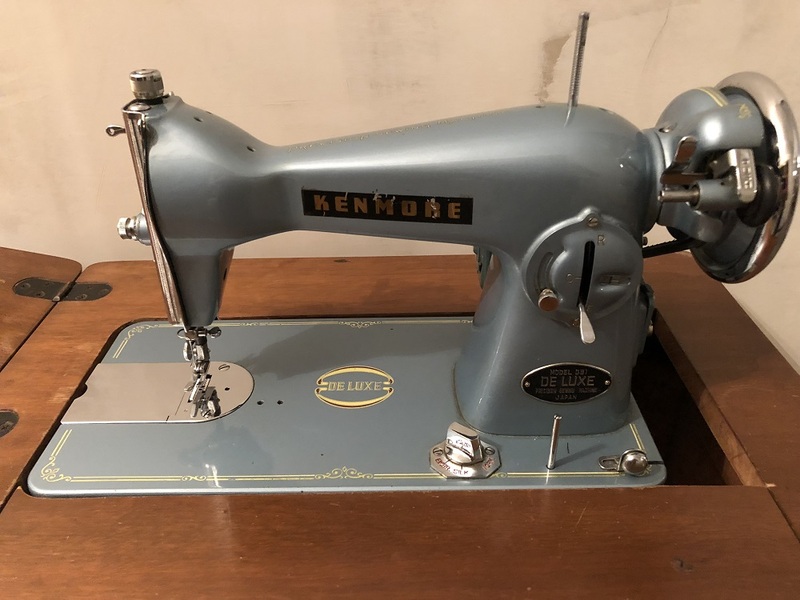 Thread: Vintage Kenmore Deluxe Rotary ~ Would Love More Info! It would be intersting if anone has started gathering serial numbers and compared the Japanese models. The large export of Japanese machines began after WWII, and before that time I guess there were 15 clones in production. The very early Pine models look more like the European 15 clones, with the type of stitch length lever you find on Pfaffs and Husqvarnas. The European 15 clones had reverse lever by 1920s and some could drop the feed dogs too. It might be the reason Japanese clones incorporated these features on their machines after WWII. I guess the typical Singer stitch length lever with reverse appeared after 1954 when Singer bought into the Pine company? You can't go by the "deluxe" badge on the early Kenomores, at least not alone. You will find all kinds of referance words like "deluxe", "automatic", "-omatic", between brands all of the 50s and 60s, not just Japanese. The 1930s Kenmores were US made, often rotary hook and race. The Japanese probably borrowed the words from existing names and brands. They largely aimed for the US marked. What you have is a common 15 class clone. I don't think I've ever seen one with the Kenmore badge on it. The JA36 actually indicates it was built by Riccar, not Maruzen/Jaguar. This is a mid 50s clone going by features such as the striated face plate and the feed dog drop. I have two clones that look like yours, including similar decals. One is badged as a Brother and the other one is badged as a Morse. This machine takes common low shank feet, no need to look for Kenmore specific attachments and it most likely would have originally come with the generic HA1 manual(most clones did) so you're good to go there. I forgot to add that none of the 15 clones are rotary, they are occilating hook, all variants and derivatives of Singers model 15. They start to appear just after 1900, at least they become more common then. Among the old straight stitchers there are a few rotary hook models, some US made ones; National, White, etc. They are per definition not 15 clones. It's hard to date Japanese clones, the variants of them were made well into the 1960s, and can look pretty much identical to yours. Into the 50s you can see some with the tension in front and not on the face plate, some were given a more modern looking body, various ways to adjust feed dog height, turn knob, push buttons, etc. Last edited by Mickey2; 09-14-2018 at 09:49 AM. The only thing I'd add to all these very knowledgeable comments is that it appears as though Sears & Roebuck were having their Kenmore line of sewing machines made almost exclusively by either White Manufacturing of Cleveland Ohio or New Process Gear Corporation of Syracuse New York until about 1955 when other manufacturers began to enter the scene. In 1957 the first full line of various Japanese made sewing machine models labelled as Kenmore were offered to the US public. These machines appear to have been made exclusively by either Mauzsen (158 designation) or Soryu (148 designation). White officially lost it's contract in '58, New Gear continued to '62. Some evidence suggests that one or two specific machine models may have been made for Sears in Japan prior to 1957... but it's difficult to find documentation. White did attempt a short lived 15 clone look-a-like in 1956... but it was replaced by 1957 with a Japanese made machine. Considering this part of Kenmore history, I'd go out on limb and suggest that the earliest possible year of manufacture for your machine should be 1957, and even then... that might be too early. Your machine, with that feed dog drop dial appears identical to the Kenmore 'Commander 30' and 'Challenge' models manufactured a few years later. Last edited by Steelsewing; 09-14-2018 at 10:25 AM. *Note: Tonight's clairvoyant meeting cancelled due to unforeseen circumstances. Thank you! I have seen the Challenge model but don't know much about it. I have run into the same thing with finding information. It seems to be scarce for sure. You know... we are looking for someone with feet in Japan that might be able to research the blank spaces in the JA and JC lists... there are gaps where we have no information at all.